My favorite appliance used to be a clothes steamer bought for me direct from the manufacturer through my favorite local clothing retailer. But that was some years ago, when pressing clothes and getting ready to leave the house consumed my time every morning. Now, I work at home and for the most part no one cares what I'm wearing - not even me. These days I've found a new appliance to love - one that also consumes time in the morning, but gives back ever so much more than wrinkle-free clothes. My Moccamaster: handmade in the Netherlands, in polished silver and deepest black, my wake-up call every morning, my paean to the dawn and the most reliable piece of technology I own. Better than my laptop, way more satisfying than my cell phone and miles ahead of my TV, a worthy companion to the hand-roasted, shade-grown, fair-trade coffee beans I'm devoted to - a real friend. I have loved coffee since my grandmother first made me a cup of instant in eighth grade. In the beginning, I loved the idea of coffee: adult, sophisticated, Bohemian. Later, I loved the effect of coffee: the buzz, the feeling of well-being, the increased heart rate. 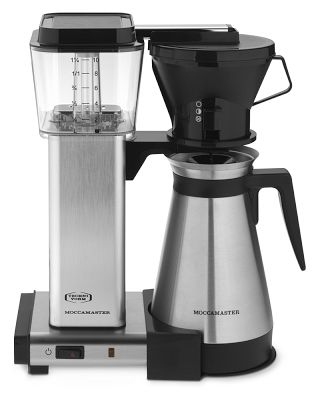 Today, I love the taste of coffee, and that's where my Moccamaster comes in. Coffee - always good - is now excellent. I've gone through many coffee makers. From a cup, a spoon, a jar and hot water in high school, to the Chemex I used as a young married woman, given to us by my then-father-inlaw, a coffee lover himself, who taught me the first rule of good coffee making: "Use enough coffee." When I lost the wood collar with leather tie that kept me from burning my hand on the glass, I took his advice and continued on to other coffee makers: the stove top percolator I used for a brief time in the mid-'70s and then on to the manual drip coffee makers I adored - including a Melitta porcelain cone bought in Alliance, Neb., that I used at least eight years after the handle had broken off. To the red plastic cones suitable for packing in a suitcase, through a variety of French presses, several stove-top espresso makers and an automatic drip coffee maker. A Mr. Coffee that I still pull out for parties and that has done yeoman service over the years - I've used them all. But as Sinead O'Connor sang, "Nothing compares to you." My Moccamaster is hands down the best of them all. It's contemporary and exciting. It's European and practical. It disassembles, it reassembles - everything fits. It's eco conscious and completely recyclable. And - it is the perfect combination of low-tech jigsaw puzzle and advanced science of precise water temperature and proper spraying radius.